I’ve only been in the Country Evangelical Covenant Church aka Lily Lake Swedish Covenant Church aka Chicken Woods Church once that I recall and that was for my Grandma Patrick’s funeral. It is possible I was there for my Grandpa Patrick’s funeral, but I am willing to bet my parents left 2 year-old me with a sitter. Grandma Patrick was a member of the church and very proud of it. My dad went there until he didn’t have to go to church anymore and I think my cousin, Robert, and his mother, my Aunt Corrine, still go there. 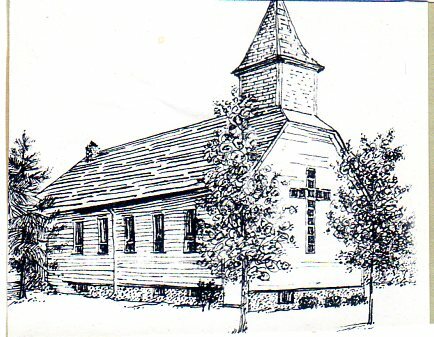 I cannot find any reference to “Chicken Woods” on the Internet, but I know my dad called the area around the church, “Chicken Woods” and the church website mentions “Chicken Grove” ((Interesting bit of historical fact, Charles Ingalls lived in Chicken Grove for a few years as a child.)). I even think my husband and his brothers refer to it as “Chicken Woods” so perhaps it was a local name for the area. In Grandma Patrick’s curio-cabinet was a framed drawing of a church that I always thought was of the church she attended in Denmark as a child, but now I see it was the Lily Lake Church. So that’s all I have to say — here’s the drawing, probably from a church program.